Seaside National Park is one of the most important sights of the capital of Azerbaijan. In the past few years, Baku Boulevard has grown enormously, covering almost the entire inner part of the bay. The length of the Seaside National Park, which previously was 16 km, reached 25 km after the major reconstruction. Today it is one of the longest and most beautiful seaside parks in the world with an extensive infrastructure, unique green spaces, attractions, restaurants and cafes, various entertainments, sports, concert and shopping complexes. Next year Boulevard will celebrate its 110-year anniversary. 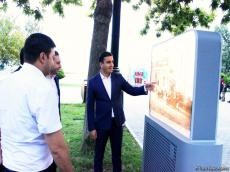 An exhibition "History of Baku Boulevard in Photos" has opened in the Seaside National Park to mark the 20th anniversary of the historic event. In 1999, the boulevard was proclaimed a National Park by the national leader of Azerbaijan Heydar Aliyev. The project, organized by the Seaside Boulevard Office, aroused great interest of Baku residents and guests of the city. Elmir Bagirov, the head of the Office of the Primorsky National Boulevard Office noted that the main goal of the project is to provide the general public with the history of one of the most favorite places for recreation of Baku residents. The outdoor exposition behind the Park Bulvar building is open to all comers until March 31, 2019. In the future, the Office will also implement a number of projects dedicated to the Baku Boulevard. The exposition presents more than a hundred rare photographs from 1861 to 1990, which are collected from private archives, foreign and domestic archives and are first presented to the general public. The photos reflect the amazing history of the birth, construction and development of the Seaside Boulevard. There are photos that were taken before the construction of Baku Boulevard. As they say, it's better to see something once than to hear about it a hundred times.